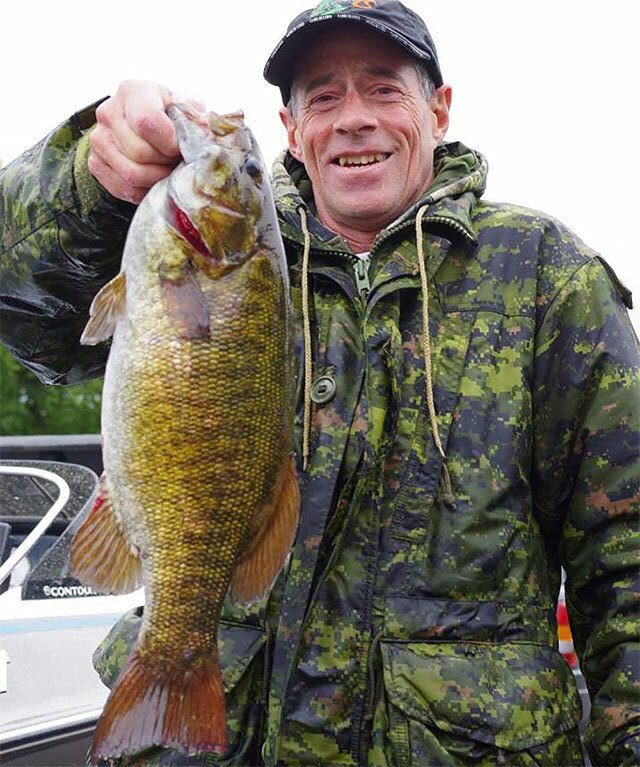 The fourth tournament of our Ottawa Valley South Bassmasters (OVSB) season was on Muskrat Lake at Cobden, Ontario. 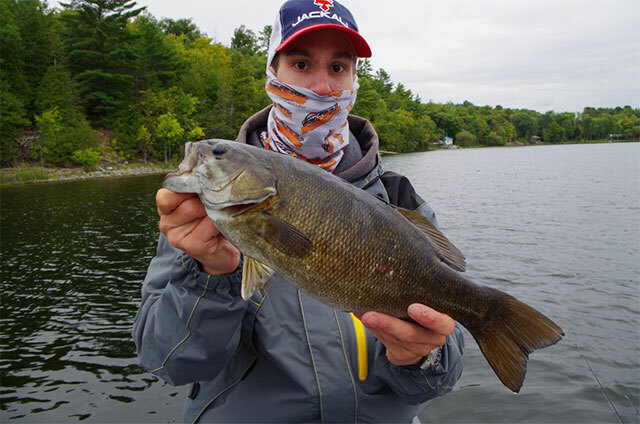 I had my first club victory in my the third tournament a few weeks earlier on Big Rideau Lake, realistically by the skin of our teeth, so I had no illusions of finishing well fishing on a lake I had not seen in three years. My partner for this adventure was a young lad by the name of Tyler Smith; his enthusiasm was intoxicating and infectious. The plan was for us to fish around the launch area for 20 minutes to see if there were active fish in the milfoil clumps; the fact that a big bucks tournament was held here the previous weekend did not matter much, as I figured it just displaced a few of the larger fish towards the launch area. This, hopefully, would play into my strategy and then it would be “hit the humps” time and then power fish some shoreline sections all before the rain started. At noon time we would go for lunch at a big fish spot and then, if possible, do some “run and gun” type of fishing, so I had hoped we could get a decent limit by 10:30. The Tournament morning was a slightly windy, dull, grey overcast day with the impending threat of rain in the air; the type of weather that should shut the smallmouth off. The first spot near the launch ramp proved uneventful for bass, but a pike provided momentary excitement by swallowing my jig, so quickly it was off to the first hump. This shoal comes out of 90 feet of water and is overlooked by some anglers. So as I pulled up on to it, I discovered we had it to ourselves and that made me happy. I was hoping the fish would be in about 16 to 20 feet of water, so I put the trolling motor down as we hit 30 feet of water. I used a combination of two fish finders on the front of my Gambler bass boat, one continually in flasher mode and the other I use for GPS positioning and down imaging. With this combination I can usually find the “spot” on the spot. If not, I use my Aqua Vu camera to confirm what I think I see on the LCD screens if I need 100 percent confirmation as to what I’m seeing on the fish finders. As it turned out, the camera nor any fancy electronics were necessary that day, not when the fish were biting. While fishing the first hump I noticed a large line on the down imaging screen and I immediately sent my drop-shot with a Gambler Lures Shakey Shad down to see what it was. It didn’t take long to get a bite and then quickly lose a good fish by the side of the boat because of my bad hookset. I never really had the fish because as I set the hook, the fish came up and I couldn’t catch up to it in time before it had a chance to spit the hook a few feet from the boat. “Well, it looks like the big fish are biting today,” I thought to myself. Someone is going to have a good day. Probably won’t be us. That’s what I thought after losing that fish. Well on to the next hump, hoping things would get better. I stopped farther away from the hump than I usually do, so we could fish a small section of shoreline before the bay. It proved to be a good decision as we started to get fish, a couple of small largemouth and three smallmouth in the 2-pound range, but we had a limit and it hadn’t started to rain yet. The plan was coming together, hopefully. My wife has a technique for big fish that I won’t share with you now but would certainly if you spent the day with me fishing. So as we fished a weedline I utilized her technique to entice a 5-plus-pounder to hit my jig. BOOM! Gambler Lures Ninja Jig strikes again. Now came the point where Murphy’s Law came into play. Since we were catching big fish and not starting the big motor, I didn’t want to cull as I find it turns off the school of fish we had located. Previously, I had put my scale in a plastic bag thinking it would keep moisture out but I learned that the remaining air in the bag had enough moisture in it to make the scale inoperable. This was the second time this happened during a tournament and the scale is not supposed to do this. I will be looking for a new scale. Now after the problems with the scale arose, culling was done by eye and that can be frustrating when you are looking for ounces to gain an advantage over your competition. So with every fish I was not sure of, I held it up for Tyler’s opinion too. That was how we culled our fish. After he commented, I dropped another 3.75-pound fish over the side. We culled a 17-pound bag of fish that day. You have to just LOVE days like that. Now, I’m more a pragmatist or a realist than a pessimist, so even though we were having a good day and Tyler had caught his biggest smallmouth bass ever, I still had misgivings about how much weight we had. I was sure we had a solid 17 pounds and obviously hoped for more. As the weather got progressively worse and the trip to find bigger fish had fizzled out, we decided to “shoot the works” and call it a day and play our cards, so to speak. The weigh-in was a quagmire of boats jockeying around Charles Sims’ boat with the wind still howling down the middle of the lake towards the launch. There was no cover at the end of the lake, so it made for a ballet of bass boats. I waited until I had been given a weigh bag for our fish and as I slowly but carefully put them in the weigh-in bag, I did a mental tally and crossed my fingers. Previously, I had heard of a couple 17-pound bags and then I heard Tony Morin’s weight of 19 pounds and the roller coaster ride was not looking good. Then I heard Charles say 20.56 and I thought I was dreaming. I waited to hear it again, and then I knew we had the winning bag. Now to pick out our biggest fish and see if we had big fish also; our biggest smallmouth weighed in at 5 pounds, 4 ounces. What a day and what a finish. This was my biggest weight on Muskrat Lake so far and another win; that makes it two in a row. Now, I know this is only a club event and it’s not the big leagues of bass tournaments, but I’m fishing against some very good anglers in our club who have won major tournaments in southeastern Ontario, so I consider it an accomplishment to have had such a good result on such a nasty day. Also, it was the look on Tyler’s face when he caught his smallmouth and couldn’t believe the size. It’s these moments that make fishing so great and it’s why I fish Bassmasters. Now, on to the next event at Mississippi Lake, a somewhat difficult lake for me as I have had some very good finishes and some really bad results. I can hardly wait; stay tuned.